Shahana, a 26-year old woman from Bantiar village in Bangladesh, experienced PWRDF’s bicycle and boat ambulances in a new way during her second pregnancy. Bantiar is a remote village in the char land of Jamuna. Shahana and her family live on the bank of the river Pechakola, a branch of Jamuna River. Her husband Jahangir is a poor farmer. Their first son died from pneumonia at the age of 6 months, despite the efforts of doctors at the local hospital. PWRDF and the Department of Foreign Affairs, Trade and Development Canada (DFATD) fund a Dai ghor in the village, a house where the traditional birth attendants (dai) regularly monitor the conditions of pregnant women in Bantiar and the surrounding villages. On October 11th, just a week before the Eid-ul-Azha ( the second biggest religious festival for Muslims) Shahana felt labor pain. Two of the dai went to see her. Shahana started having convulsions. The dais felt she should be taken to hospital immediately, as the convulsions could lead to eclampsia. The problem was that there were no men in the house, nor even any young men in the village who could drive the bicycle ambulance to the river bank, where the boat ambulance is docked. All the men had gone out of their villages to Dhaka to sell cows for the Eid festival. The older men remaining in the village could help in driving the boat because it had an engine, but could not pedal the bicycle ambulance. The dais decided they could not wait. So they took Shahana on the bicycle ambulance and three dais pushed it up to the river bank with the help of other neighboring women. Then they took her on the boat. The boat is covered, so her privacy was ensured. A boat man along with an old man from the village got on the boat. The dais were prepared to deliver Shahana’s baby, which could arrive anytime. They took their kit bags along just in case. Crossing the river is a two hour journey. 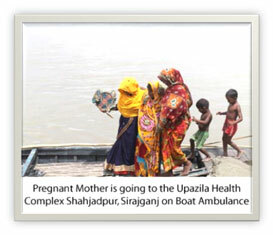 As the boat was in the middle of the river, Shahana delivered the baby – a beautiful girl. Dai Golapi named the girl Nodi (meaning “˜River’). Shahana no longer needed the help of the medical professionals at the hospital. Her convulsions stopped slowly and she was feeling better. She was feeling hungry. The dais decided to return to Bantiar, stopping on the bank of river near to another village. The Dais got out and called for help from the village women, asking them to give clean clothes for the baby and warm rice for Shahana. The women came to help the dais. These are all very poor families, most of them landless, victims of river erosion. Yet this was a happy day for them because a baby was born safely on the boat. Shahana and the dais came back safely to Bantiar. The village people thanked the Dai ghor and the bicycle and boat ambulance for the amazing incident. Shahana and Nodi are both doing fine.